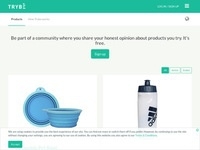 Trybe is a global community of testers who collect honest opinions about tested products! Help us to mothers & fathers for our Zalando Baby & Kids Collection gift collection. AdKlick Publisher receive 0.50 EUR for each free registration by moms or parents with children until 17 years old. The Zalando Baby and Children Collection campaign. Multiple registrations, fake registrations with incorrect data as well as registrations with disposable e-mail addresses are not remunerated. An incentive (further remuneration) is not permitted.